What goes with cast iron as well as cornbread? Fried chicken, of course! 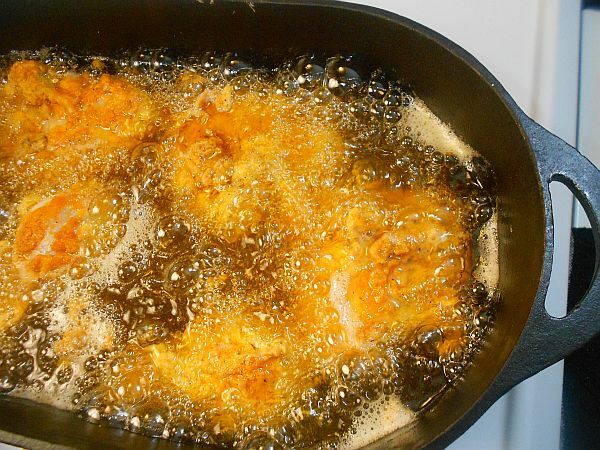 Nothing will give you a batch of fried chicken better than a cast iron pan, and you can fry chicken in just about any large cast iron pan regardless of its shape. 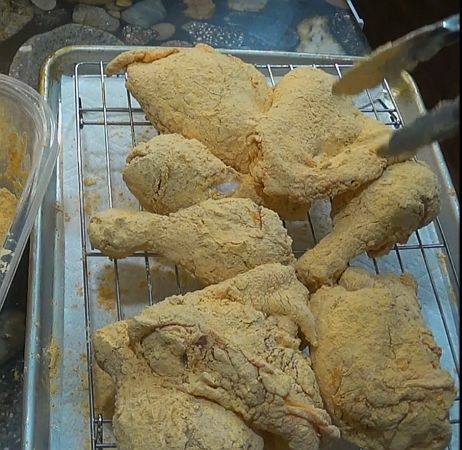 Homemade fried chicken coating is very easy to prepare, and you can prepare your own chicken coating, rather than the one listed above. 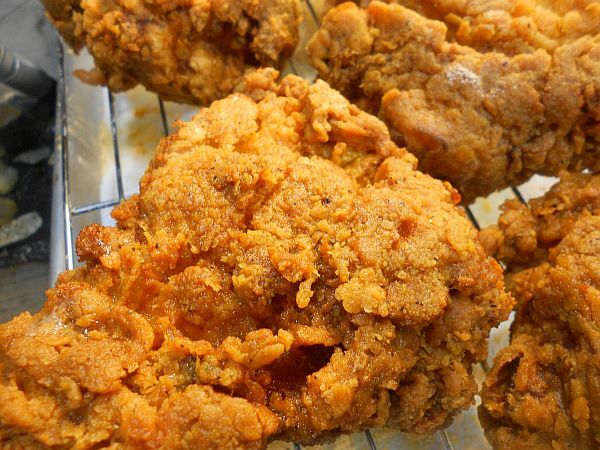 This recipe may be an "imitation KFC" recipe, but this was influenced by Crown Fried Chicken (or Kennedy Fried Chicken), which is my favorite fried chicken establishment and makes their chicken better, and cheaper, than KFC (in my opinion). There are a thousand different tricks and tips for getting a good crunchy crust on your fried chicken, and one trick I like is to mix in a little corn starch with the flour. But don't use too much or else your crust may turn out as hard as a rock. The spices we're using here are based on a so-called "secret KFC recipe" that spread across the Internet in 2016. The recipe claims to be the so called secret KFC recipe, but I seriously doubt this because KFC is a big corporation, and you can be sure their recipe would have added preservatives and other yummy chemicals. But this is still a good fried chicken recipe, and I don't have any problems using it, especially after tweaking it a little. 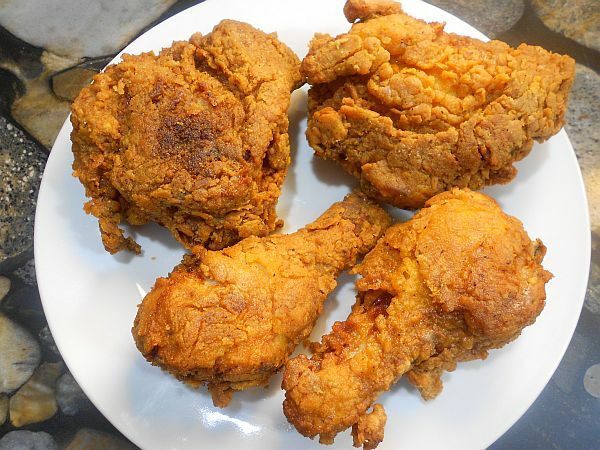 Preparing fried chicken requires several items: a lot of oil for frying, the chicken itself, and a large cast iron pan. It is absolutely necessary to fry chicken in cast iron! Anything else will not give the same results, and this is why cast iron and fried chicken go together like cast iron and cornbread. Pans needed: Large cast iron skillet, dutch oven, chicken fryer or other deep pan. A cast iron skillet should be 12 inches across, so there will be plenty of room for frying the chicken. Even better is a large chicken fryer or deep skillet, or a dutch oven. The good thing about using a deep fryer is the high walls cut down on the grease splatter. A dutch oven is also great for frying chicken, for the same reason. You will also need a wire rack for resting the prepared chicken, both before and after frying. Place chicken pieces into a bowl or container. Cover with buttermilk. Place the container into the refrigerator, and soak the chicken for at least two to three hours; overnight if possible. When it's time to begin preparing, add about 1 and 1/2 inches of corn oil to a large cast iron pan, enough so the chicken is practically covered when it fries. Heat the oil over medium heat until the temperature reaches 375 degrees Fahrenheit. As the oil is heating, prepare the chicken. Add 2 1/2 cups of chicken breading mix to a covered container or large bag. Remove the chicken from the buttermilk. Do not rinse off the chicken, leave the buttermilk coating on the chicken. Place chicken pieces into the breading mix, close the container, and shake it until the chicken is completely coated. Remove the chicken onto a rack, and let it rest while preparing the second coating. Beat three eggs, and add a little water to loosen the eggs. Add some cayenne pepper, paprika and hot sauce, and mix it together. Dip the chicken pieces in the egg wash, then place them back into the breading container. Shake it a second time to give the chicken a second coating. When the temperature of the oil reaches 375 degrees Fahrenheit, add the chicken pieces to the oil. Fry for twelve minutes. After twelve minutes, turn the chicken over, and fry the chicken for another ten minutes. Check the chicken with a thermometer and make sure internal temperature is at least 180 degrees Fahrenheit. Remove the chicken onto the rack. Let the chicken rest and drip off excess oil for five minutes. Serve.